Seen the latest issue of Contact Lens Spectrum? It was hard to miss that most of the articles were discussing study results about contact lens performance and where Ultra ranks against today's most popular lenses. Bausch and Lomb's new monthly disposal Ultra contact lens has taken the market by storm since its full launch earlier this year, and there are plenty of things to like about the lens. Here's a breakdown of the study results published in the CLS supplement. Disclaimer: I want to add that the studies featured were all reported on by doctors with Bausch and Lomb and its parent company Valeant Pharmaceuticals. I myself am not affiliated with any contact lens company or pharmaceutical company and am just presenting a summary of the findings from this report. I have cited all tables included to their origin source of Contact Lens Spectrum, but at this time I have not found that they are available online. I will update things here when they do become available for you to direct link to. Do you feel like your lenses get more blurry at the end of the day? That's a common complaint, and can best be explained by the lens drying out as your eye also dries out with long hours of computer and digital device use. It's not just that your eyes are tired; your contact lens absorbs moisture from your eye's tear film, and if they are dehyrdated enough, your contact lens will start to lose its clarity too. To get great vision all day long, we need a lens that can keep a stable surface even when your tear film starts to get less than perfect after a long day on the computer or phone. Because we blink less frequently on digital devices (about 50% less often), our vision can be greatly affected if our contact lens isn't staying moisturized in between our blinks. On average we should blink about every 13 seconds, but in computer or digital device users it can be double this. For the study reported on here, doctors measured the optical clarity of the lens in logMAR units (see image below) for a period of 30 seconds (and please let's hope you blinked after this!). As you can see, image quality can change greatly. This testing was performed in a simulated lab environment and not on an actual human eye. LogMAR units are used here to demonstrate visual clarity as perceived by the wearer. 20/20 is the perfect vision we all try to achieve during the eye exam and is shown above. 20/40 is legal driving vision. Image from Contact Lens Spectrum Special Edition Volume 14, "Preventing Dehyrdation Blur"
Based on the study performed, image quality can vary greatly between blinks across different lens types. 30 seconds would be an incredibly long time to go without blinking, but many of us as computer users do go longer than 20 seconds without blinking, and you can see the blur that accompanies this. The Ultra lens in this simulation performs far and away better at keeping clarity even as the lens material is kept without moisture for 30 seconds. Image from Contact Lens Spectrum Special Edition Volume 14, "Preventing Dehyrdation Blur"
Every time we blink, our eyelids must move over the contact lens we are wearing. As you can imagine, if this surface isn't smooth or provides any resistance, then by the end of the day your eyelids can really be scraping uncomfortably along. I will sometimes see the side effects of this when I check patients at their yearly examination. Clinically called lid wiper epitheliopathy, your doctor can visibly see desiccated or rubbed up surface cells along the edge of the eyelid if this is happening to you. For better comfort and less rubbing of the eyelid across the contact lens, we would theoretically be trying to engineer a contact lens that provides low amounts of friction so that the eyelid can just glide across the lens. And we want the surface to stay moisturized all day long if possible so that every blink gives the lens a nice smooth top coat of natural tear film. How the lens performs at the beginning of the day may not be exactly how well it does at the end, but in an ideal world you want a contact lens that will hopefully stay smooth and moisturized all day long. Table showing roughly good consistency in wetting ability across all lens brands compared. Dailies Total 1 (CIBAVision's excellent single use lens) gets the best marks here. Table from Contact Lens Spectrum Special Edition Volume 14 "Breaking the Cycle of Discomfort"
In the table above contact angle is the numerical classification of how a lens is "wetting". A contact angle of 0 means that the lens has complete wetting, where an angle of 90 means the surface isn't wettable at all. The lower the number, the better the wetting of the contact lens polymer. Friction measurements were done with a rheometer while the lens was submerged in buffered saline (meaning this studies results like the wetting angle were done in a scientific lab and not on the eye, but set up to approximate on-eye responses). Static friction was used to simulate the time between blinks when the eyelid isn't moving. Fast and slow kinetic friction were measured to simulate different blink speeds (slow blinkers versus fast blinkers if you will). With these studies you would ideally want a low coefficient of friction in all phases. In the table to the right, Dailies Total 1 appears to have significant friction when there is no movement, but then performs well during the blink simulation or "kinetic" friction. 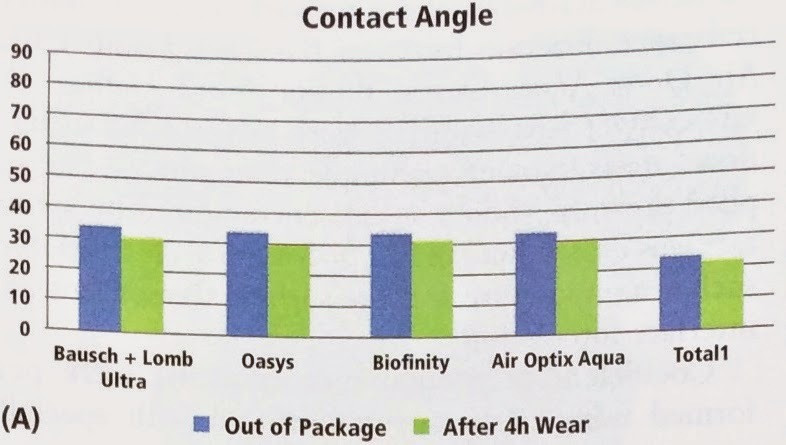 The more important take home appears to be that in almost all of the lenses (except Air Optix Aqua here), the friction between the contact lens surface and the outside world (eyelids in the practical sense) does not appear to get significantly worse after four hours of wear. It would have been interesting to see how the lenses performed after 12 or 14 hours though, since most of us wear our lenses at least that long. Table is from Contact Lens Spectrum Special Edition Volume 14, "Breaking the Cycle of Discomfort". Table showing differences on the surface of the contact lens when new, and after 30 or 15 (in the case of Oasyss) cycles of cleaning and rubbing with solution. Table from Contact Lens Spectrum Special Edition Volume 14 "Breaking the Cycle of Discomfort"
Surface smoothness was assessed in the above table with Atomic Force Microscopy and X-ray Photoelectromorphology. Imaging was taken of both unworn lenses and then again after 30 rinse cycles with Renu Multi-purpose solution (aiming to simulate end of month wear). For Acuvue Oasys (a 2 week lens), 15 rinse cycles were used instead since it is only meant to be used that long anyway. Interestingly the new Biofinity lenses seemed to have more irregularity on the surface than ones that had been cleaned 30 times. The Ultra lens was amazingly consistent in surface smoothness from beginning to end in this study. When I first saw this edition of Contact Lens Spectrum, I was blown away by all of the favorable studies that were reported for Bausch and Lomb's new Ultra lens. My patients have had a lot of success with the lens also, but seeing it perform on so many different levels was a page-turning read for me. There are some things to consider about this reporting -- the studies were all reported by those within the Bausch and Lomb or Valeant family, and the results of the studies used here were done in lab simulations and not on actual human eyes. There were also great subjective reports for patient comfort, vision, and doctor ease of fit included in the magazine supplement, however that were meant to speak to "real life" lens performance. I look forward to seeing more head to head lens comparisons from third party groups in the future, but any time a genuinely new product enters our industry, it is exciting to be able to offer a different option to patients who have been living with contact lens dissatisfaction in their previous lenses. Ultra remains a great choice for me in patients who want a monthly wear lens, but have been dissatisfied with previous monthly lens options.